Dean Ager is widely regarded as one of the finest Frank Sinatra tribute singers and 'Big Band' vocalists in the UK. If you're looking for a Frank Sinatra tribute singer for a wedding, corporate event, party, or any other function, then look no further. Dean Ager is the perfect choice for you. Dean can be hired as a solo-singer, or together with his fantastic Frank Sinatra tribute band or trio band. Dean can even entertain you into the night with his professional disco and DJ skills. Dean doesn't just sing Sinatra's songs - when he's on stage, he is Frank Sinatra. Dean mimics the style, the voice, the phrasing, and all the mannerisms of Sinatra, perfectly. 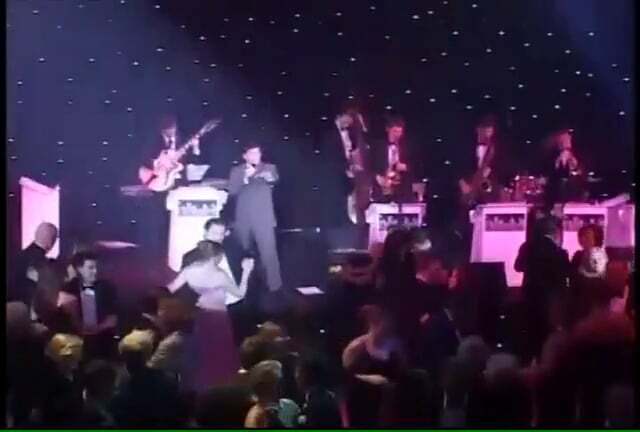 And unlike other Sinatra singers, he only uses the finest and most authentic fully-orchestrated backing tracks to give you the very best Frank Sinatra tribute show for your special event. Dean Ager is much more than a Frank Sinatra wedding singer standing in the corner like other lesser singers. Instead, he will bring back, for a fabulous show, Frank's unique and charismatic style - roaming the tables, dancing, and joking, which is all guaranteed to get the party going. Dean is a professional Frank Sinatra tribute artist, so you can book with 100% confidence. Francis Alberto Sinatra was born in Hoboken, New Jersey, on 12th December, 1915. Sinatra was a school dropout who wanted to become a swing singer after seeing his idol Bing Crosby sing. He was the only child of parents migrating to America from Sicily, looking for a better life. In September 1935 Sinatra then took a job as a singing waiter and MC at the Rustic Cabin in Englewood, NJ. He started out singing in his home town with the Hoboken Four. In 1939 they appeared in nightclubs and also radio exposure on Major Bowes' Original Amateur Hour brought him to the attention of bandleader Harry James, with whom Sinatra made his first early recordings, including "All or Nothing at All." In 1940 Sinatra was approached by bandleader Tommy Dorsey to join his band as a replacement for Jack Leonard appearing with the band in the films Las Vegas Nights (1941) and Ship Ahoy (1942). After just 2 years Sinatra left Dorsey and went solo amid rumours of Sinatra's involvement with the Mafia boss mobster Sam Giancana advising Dorsey to let Sinatra out of his contract. By 1946 Sinatra had amassed over 17 top 10 hits winning him an army of female fans. These groupies called themselves "the bobby soxers." Sinatra made his movie acting debut in 1943, with Higher and Higher. And in 1945, he won a special Academy Award for The House I Live In. Sinatra's career was slipping away but in 1953, he made a triumphant comeback, winning an Oscar for "Best supporting actor" his portrayal of the Italian-American soldier Maggio in the film "From Here to Eternity." Sinatra went on to sign with Capitol Records, and arranged with Nelson Riddle, Gordon Jenkins, and Billy May with highly successful albums, including In the Wee Small Hours (1955) Sinatra's first 12" LP and his second collaboration with Nelson Riddle, Where Are You? (1957) and Frank Sinatra Sings For Only The Lonely (1958). Swing Easy! (1954) Songs For Swingin' Lovers (1956) and Come Fly With Me (1957). Other noticeable acting performances were in films such as Suddenly (1954), The Man With the Golden Arm (1955, nominated for best actor at the Academy Awards) Guys and Dolls, The Joker is Wild (1957) and Some Came Running (1958). Sinatra left Capitol to establish his own record label, Reprise. In association with Warner Bros., which later bought Reprise, Sinatra also set up his own independent film production company, Artanis. Sinatra's vocal style had changed quite dramatically from his early career where before he had been a soft smooth baritone crooner, now it was a more mature sound with jazzier inflections in his voice, to compliment the brass section of the big band. in 1961 Sinatra had album hits Ring-a-Ding-Ding!, Sinatra at the Sands and Francis Albert Sinatra & Antonio Carlos Jobim), Sinatra was a founding member of the Rat Pack and appeared with celebrities and statesmen, including John F. Kennedy, and Marylyn Monroe. Having regained stardom, Sinatra enjoyed continued success in both film and music for years to come. He received critical acclaim for his performance in the original film of The Manchurian Candidate (1962). Meanwhile, he continued to chart Top 10 singles. Sinatra turned 50 in 1965, recorded the retrospective September of My Years, starred in the Emmy-winning television special Frank Sinatra: A Man and His Music, and scored hits with "Strangers in the Night" and "My Way" written by Paul Anka. In 1967, Sinatra had a million selling hit with his daughter on "Something Stupid." Sinatra finally retired in his 80th year in 1995 and died on 14th May 1998 of a heart attack at 82. Sinatra's career spanned over 60 years. As a movie star and as a celebrity of mixed reputation, Sinatra is so much of a 20th century icon.